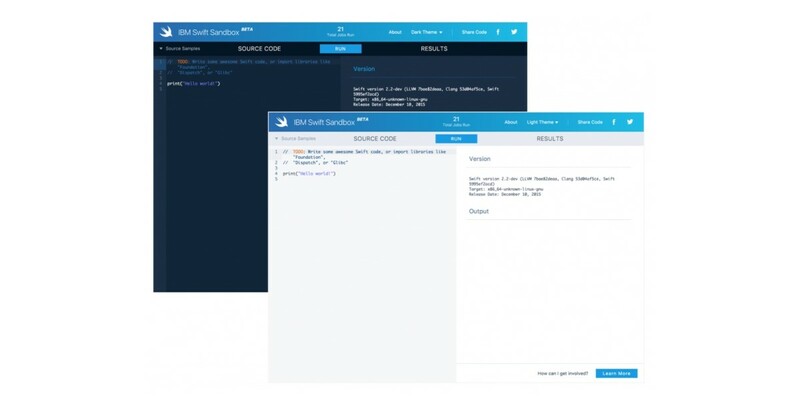 IBM’s Swift Sandbox has added a few key features: themes and code sharing. In addition to the plain white screen, you can now choose a dark theme. The source code text remains mostly blue, while the results are returned in white. Code sharing is going to find favor; it takes an immutable snapshot of your code, and spits out a shortened URL. That’s handy for posting to Stack Overflow or directly with friends and colleagues. There’s also an option to share code directly to Facebook or Twitter. These changes come to version 0.3 of IBM’s Swift Sandbox. If you believe in version numbers hinting at the significance of an update, these are fairly minor changes. A full-stop version 1.0 could be pretty exciting.